BBACPAX only has two measurement days left, and yesterday evening we received what is likely to be our final storm. Just about a half an inch of rain fell between 3 pm and 11 pm. In the rest of this post I will review the storm from yesterday and preview our IN measurement strategies for today and Friday, which should sample some interesting flow regimes we have not yet seen. 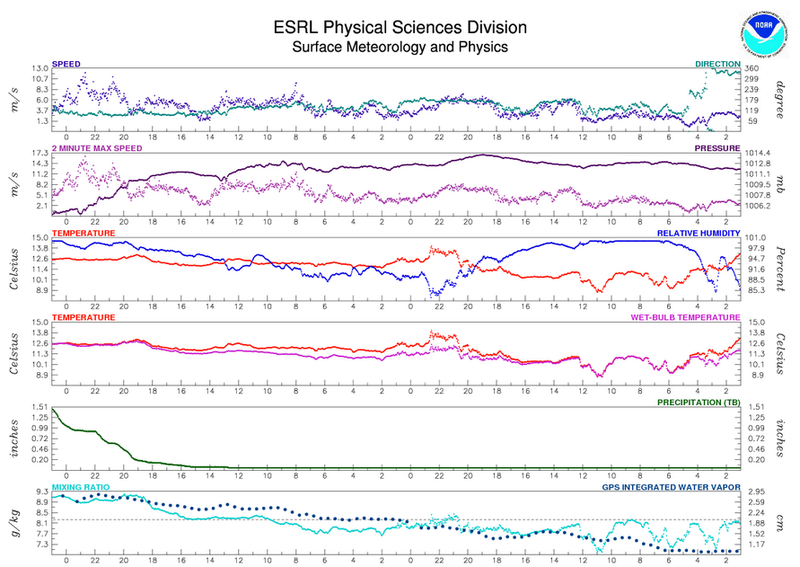 Timesereies of surface meteorology at BBY for the 48-hr period ending at 18 UTC on March 6, 2014. Credit: NOAA-HMT. Note that this corresponds to the period of maximum westerly winds at the surface. Time-series of low-level wind profile and IWV flux from the 449 MHz wind profiler at BBY for the period ending at 18 UTC on March 6, 2014. Credit: NOAA-HMT. Some things to note in the above figure: 1) The mid-level ( > 4 km AMSL) winds became really strong when the mid-level trough arrived. 2) The southwesterly flow caused upslope IWV flux to Cazadero to spike for a short period, which is when it rained at CZC. 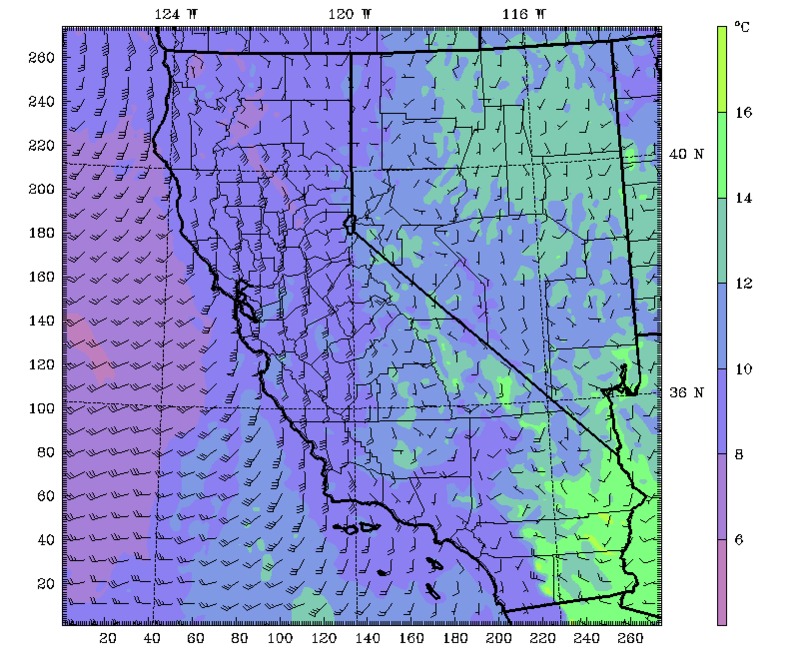 3) the wind does not suggest a cold front at the surface, however the wind at 0.8 km height near 9 pm PST does. As we will see later, this system was a developing ET cyclone, and it may be that a frontal boundary was developing over our area last night. Back Trajectories based on 24-hr NAM 4 km forecast ending at 12 UTC on March 6, 2014. Credit: NOAA-HYSPLIT. Source regions identified by HYSPLIT suggest that we had southwestern airmass exposure yesterday morning, and that this shifted to western exposure as the afternoon wore on. This corresponds to the westerly winds arriving before the rain. During the morning, we noted higher than normal concentrations of coarse-mode particles on the APS. Gavin and Christina also noted a large number – 150 particles – that were sampled by the CFDC-pCVI-ATOFMS system in only a couple hours. These were mostly sea-spray (SSA) like, but did support ice nucleation at -32 degrees Celsius. I mentioned the above because the storm arrived without the flow regime changing much – i.e. we should have still had numerous course mode aerosol at the start of the rainfall. It will be interesting to evaluate the time-resolved precipitation sample we have to see if the SSA played a large role in cloud nucleation, or were simply scavenged at the beginning of precip. 850 hPa wind and temperature from NAM analysis valid at 00 UTC on March 6, 2014. Credit: NCAR (model), Weathernerds (figure). Note the AR-like southwesterly flow. The IWV in the surface met trace (bottom panel) confirms that AR conditions were with us for a short time. 500 hPa temperature and wind from the NAM analysis valid at 00 UTC on March 6, 2014. Credit: NCAR (model), Weathernerds (figure). MIMIC-TPW valid at 00 UTC on March 6, 2014. Credit: UW-CIMMS. This is now the 3rd AR we have had in the last week-plus. Northern California should see another on Sunday! After 7 pm, winds here at BML are forecast to become northwesterly. At the same time, they will be potentially flowing across a baroclinic zone associated with the rapidly broadening low-pressure center of the storm which just left us. This will cause air parcels to sink along their Lagrangian path. Aerosol optical thickness (AOT) overlaid on true color image from MODIS-Aqua near 2230 UTC on March 5, 2014. Credit: NASA-EOSDIS. Aqua’s afternoon overflight of the storm system shows an intrusion of dry air into the rear northwest sector. Aerosol Optical depths from the same swath are greater than 0.6 in some areas. It is this dusty area that we expect some of our evening trajectories to pass through. CFDC and ATOFMS will be coordinated to catch the transition from clean-marine (4 pm to 6 pm) to dusty (7 pm and later) source regions. Comparing the ice nucleation, coarse mode particle counts and mass spectra from the two regimes will be very interesting. What was supposed to be an unremarkable series of evening rain showers turned into nearly an inch of rain here yesterday (Monday, March 3, 2014)! The official forecasts were slow to pick up on this rain. in fact, as late as Sunday afternoon, the national weather service was predicting 50% PoP and was not assigning a quantitative precipitation forecast. There was much about this storm that was unexpected. Let’s investigate a bit to see why it was so hard to predict in advance. 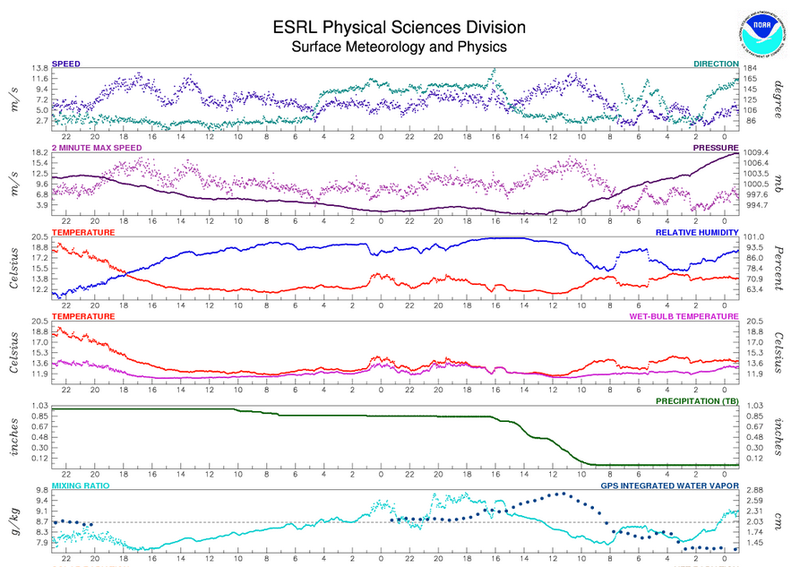 Timeseries of surface met conditions at BBY for the 48 hour period ending at 0800 PST on March 4, 2014. Credit: NOAA-HMT. MIMIC PW analysis for the NE Pacific valid 2000 UTC on March 3, 2014. We had an inch of rain, over 2 cm of IWV at BML for more than 24 hours, and a long filament of enhanced water vapor which connected to the tropical Pacific and made “landfall” on the Northern California coast. Yet, as I mentioned above, the rainfall was somewhat a surprise. The reason is that there was not an obvious dynamic forcing mechanism to provide lift – and convert water vapor into water condensate. This can be seen in the GCM forecasts for Monday afternoon. ECMWF 48 hour forecast MSLP (left) and 500 hPa geopotential (right) valid at 00 UTC on March 4, 2014. Credit: ECMWF. Same as above, except 24 hour forecast. Same as above, except analysis. The surface and 500 hPa analysis from ECMWF above make it clear that yesterdays AR conditions were not typical, in that the AR did not arrive in the warm sector of a pacific extratropical cyclone. Timeseries of wind vectors measured by the 449 MHz wind profiling radar at BML and upslope IWV flux for the 48 hours ending at 16 UTC on March 4, 2014. Credit: NOAA-HMT. The plot above does elucidate two features, however. The first is a mid-level trough which propagates above the profiling radar. Winds at 3 km turn cyclonically with time – from southwesterly to westerly to northwesterly – during the time period starting at noon yesterday and ending at 4 am. The second feature is the delay in BML rain compared to the rain at Cazadero. Note that the coastal rain rate peaks while the mid-level trough passes above, while the CZC rain rate peaks when the wind projected along 230 degrees (SW) is strongest. Analysis wind shear in the layer bounded by the surface and 850 hPa, valid at 12 UTC on March 3, 2014. Credit: NCAR (model), Weathernerds (visualization). 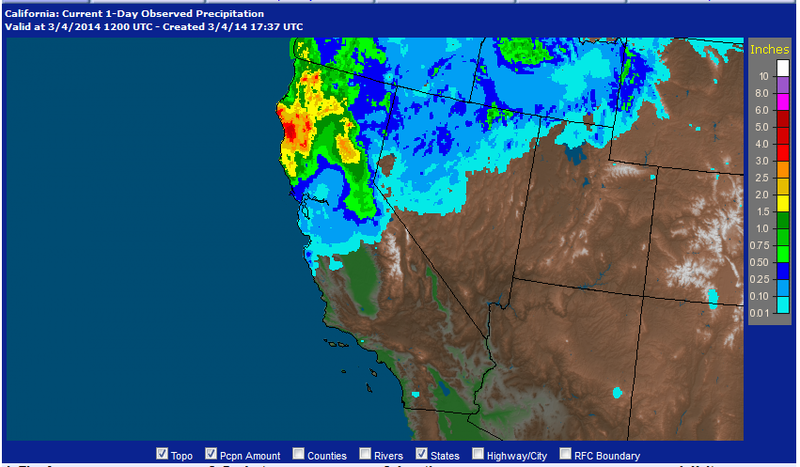 24-hr rain estimate from composite of WSR-88D radar network for March 3, 2014. Credit: NOAA-NWS. GFS Analysis water vapor mixing ratio (g/kg) at 850 hPa valid at 00 UTC on March 4, 2014. Credit: NCAR (model), Weathernerds (figure). The GFS analysis of water vapor mixing ratio at 850 hPa from 00 UTC yeseterday picked up on a channel of moist Southwesterlies intersecting the CA coast. This is the same flow that can be seen in the 449 MHz profiling radar plot, and likely extends SW well into the tropical Pacific. This flow is the AR. S-Band signal-to-noise ratio (with brightband) timeseries from CZC ending at 16 UTC on March 4, 2014. Credit: NOAA-HMT. A precursor seeder (upper) cloud, along with satellite and aircraft aerosol measurements, is something we use to indicate that upper-level long-range transported ice nuclei were participating in the precipitation process above CZC. In this case, the upper level cloud was, and the upper level ice nuclei may have been, missing. In this post, I showed a GEOS-5 forecast which indicated dust may arrive just before and during Monday’s rain event. We took time-resolved precipitation samples during the rainy periods yesterday. It will be interesting to see if the rain samples contain significant dust from this storm; and whether that dust is present from time periods when clouds were likely shallow, or whether it appears only when echo tops are well above the freezing level. Skies have been mostly overcast the last several days, however plenty of color can be found nearby if you know where to look! 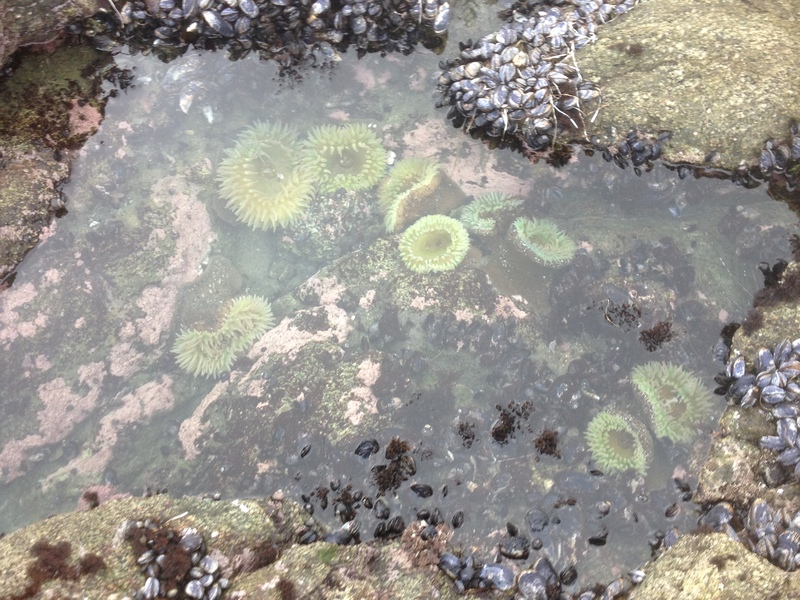 Anenomes in a tide pool near Mussel Point, Bodega Marine Reserve, CA. 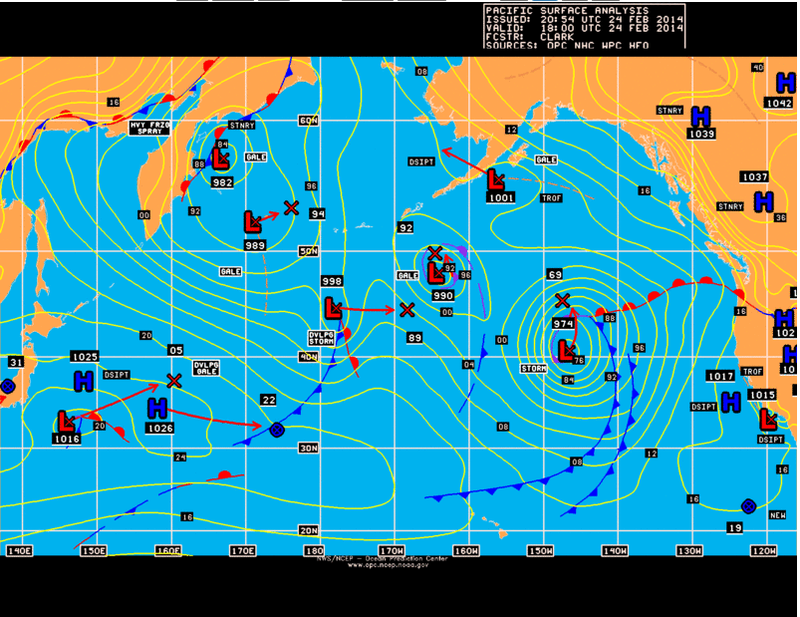 Surface analysis for the Northeast Pacific Valid at 12 UTC on March 2, 2014. Credit: NOAA-OPC. A broad area of low pressure is in control over the Northern Pacific. This will continue over the next several days. However, as we will see in coming posts, the storms which come eastward toward the Pacific coast are not expected to intensify or dig south, due to a bland zonal upper level pattern. It has been a couple days since I posted a weather update from BBACPAX, so I will review what happened here for the past 2 days. We picked up an additional inch of rain here on Friday evening and early morning Saturday. Most of this came near a mesoscale front which passed us at 3 am PST on Friday. 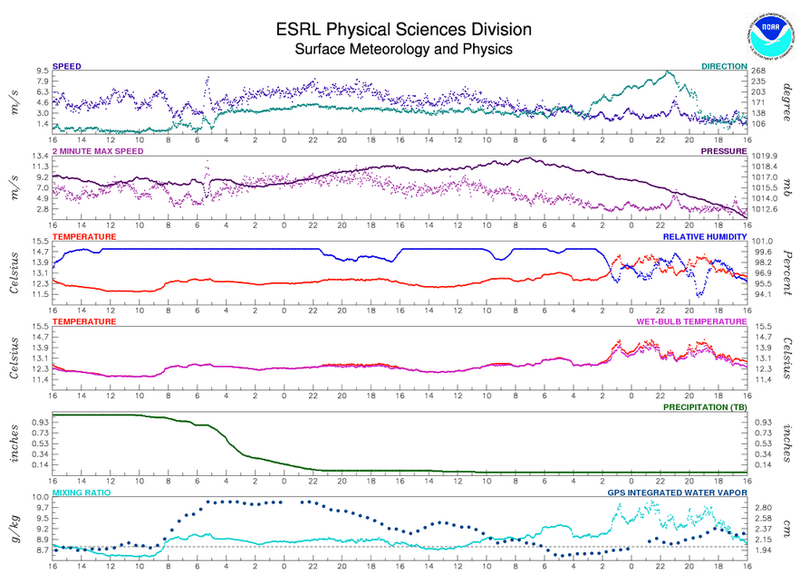 Surface met variables at BML for the 48 hours ending at 00 UTC on March 1, 2014. Credit: NOAA-HMT. 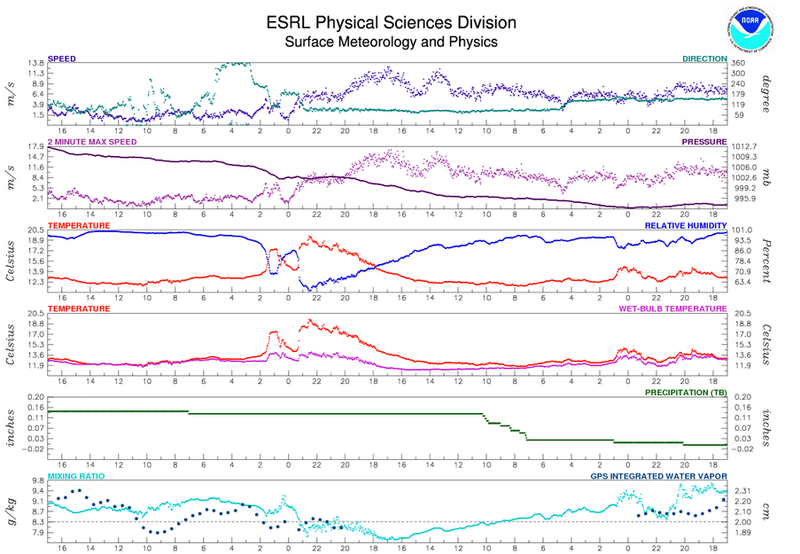 Surface met variables at BML for the 48 hours ending at 17 UTC on March 2, 2014. Credit: NOAA-HMT. During the strong Easterly flow period yesterday, the sun came out, visibility was extremely good and we had very low particulate mass. However, total particle counts peaked over 20,000 per cc. There was a single size mode measured by SMPS near 30 nm, but larger particles were nearly non-existent. We also noticed a slow increase then decrease in the SO2 concentration. Taken together, these measurements after a major rain storm are indicative of a new particle formation (NPF) event. During NPF, organic gases (VOC) participate in heterogeneous reactions and condense to form secondary organic particles in the Aitken size mode. NPF must occur in the absence of larger organic aerosols, as the pre-existing larger particles will grow at the expense of the VOC gas before it can nucleate. Thus, NPF is often observed after rain has scavenged existing particles from the planetary boundary layer. Trajectories over BML also passed over the Central Valley and North Bay Area, which are places that could provide the VOC and oxidizers necessary for the reactions. It is yet unsure whether NPF occurred locally or whether it occurred upstream of our location and the Aitken mode particles were simply transported here. We will have more analysis of the chemical data associated with this event soon! Forecast back trajectories from BML for the next 24 hours based on NAM 4 km forecast. Credit: NOAA-HYSPLIT. We are interested in characterizing the ice nuclei activity of naturally emitted marine biological aerosols and measuring their chemical mixing state in-line using our CFDC-pCVI-ATOFMS system. We prefer West to Southwest trajectories in order to perform this analysis, since the source regions associated with W or SW trajectories are over the open ocean and therefore less likely to experience shipping traffic or continental air influences. Because of these trajectories, we have identified this afternoon and tomorrow morning as targets for CFDC-pCVI-ATOFMS measurements. 3-hr precipitation forecast from MM5 4km valid at 1900 PST on March 3, 2014. GEOS-5 also expects us to see an increase in dust AOT over CA during this same period. 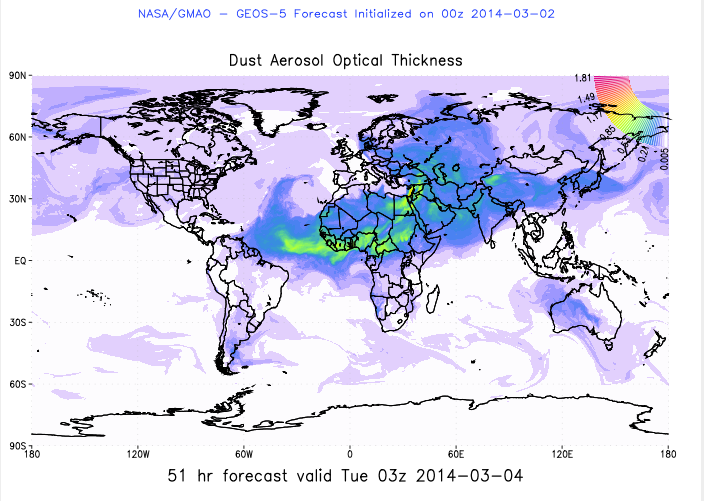 Dust AOT forecast by GEOS-5 valid at 1900 PST on March 3, 2014. Credit: NASA-GMAO. It is uncertain whether cloud tops will be high enough to intercept this next dust plume, as both the surface system associated with the rain, and the large scale trough associated with the dust are fairly weak. We will have to watch the S-Band radars at CZC and STR, our ATOFMS LVN and our precipitation samples to learn whether dust participates in the precipitation forming process for this small storm. After Monday night, the next storm system to impact our area will arrive late Wednesday to early Thursday. We will examine that system in the next weather post. After a good soaking yesterday, the sun has come out for a brief hello. Time-vertical cross-section of wind and virtual temperature from 449 MHz radar + RASS at BBY for the period ending at 11 am PST on Feb 27, 2014. Credit: NOAA-HMT. As can be seen in the wind profiles, winds turned from SSE to SW after the boundary, and the lower atmosphere actually warmed. As we will see, freezing levels did not change much after the boundary either. 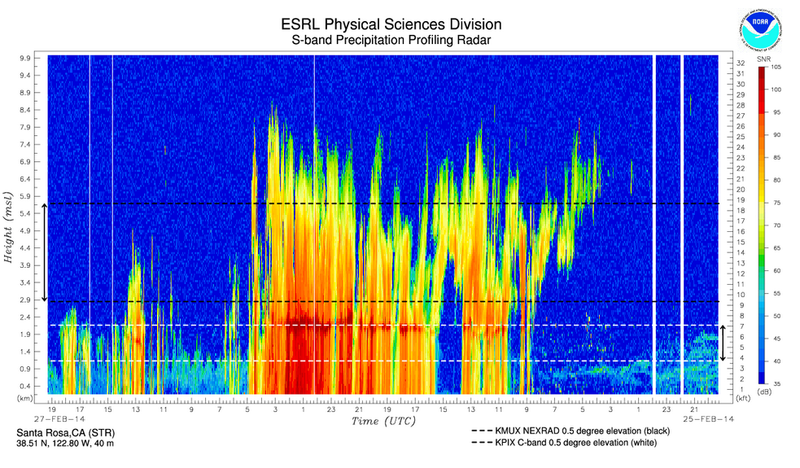 Time-Vertical cross section of signal-to-noise ratio from the S-Band Radar at CZC for the period ending at 11 am PST on Feb 27, 2014. Credit: NOAA-HMT. 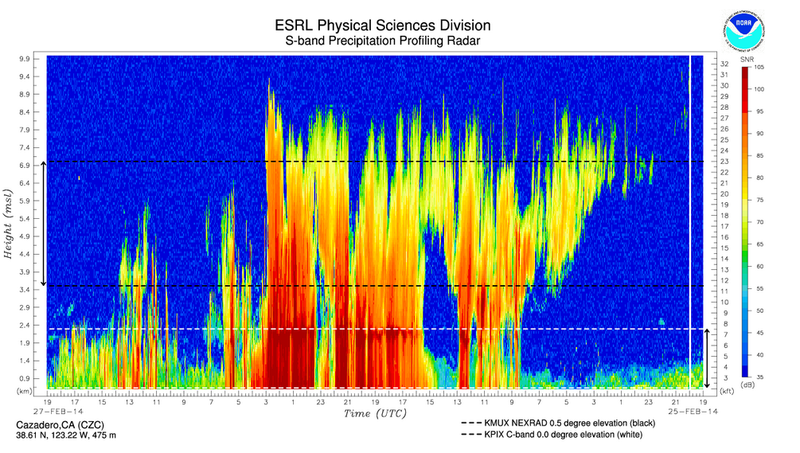 Time-vertical cross section of signal-to-noice ratio from the S-Band Radar at STR for the period ending at 11 am PST on Feb 27, 2014. Credit: NOAA-HMT. Time-vertical cross section of wind and timeseries of upslope IWV at BBY for the period ending at 11 am PST on Feb 27, 2014. Credit NOAA-HMT. In this case, the upslope wind direction is defined along the vector which points from BBY to CZC. as Southerly winds really sped up near 6 pm yesterday, upslope IWV also shot up, and for the period where the value exceeded 20 knot-inches, precipitation was enhanced at CZC compared to BBY. Yesterday in this post, I mentioned that we observed dust at the surface for most of the morning, while the storm was coming ashore. We also expected high altitude dust in the storm’s central circulation. There are a few ways that elevated dust could reach our site at the ground. 1) Dust aerosol could be scavenged by falling raindrops, which then make it into our precipitation sampler. 2) Dust aerosol could act as cloud condensation nuclei, which grow into or become incorporated in a rain-drop or precipitating ice and make it into our precipitation sampler. 3) Dust aerosol could act as ice nuclei, which grow into ice-phase precipitation particles, melt on their path to the surface and make it into our precipitation sampler. We are most interested in the last possibility, which means that we would really like to collect dust during periods when the precipitation profiling radar is telling us that there is cloud ice over our heads (i.e. a brightband is present) in a deep layer. Even at STR, whose radar likely mimicked the cloud structure that existed over us at BBY, there were long periods of high cloud-top echoes over brightband rain yesterday. Given that we expected a deep tropospheric layer of Asian dust, particularly in the early phases of this storm, that is good news for our precipitation residue analysis! 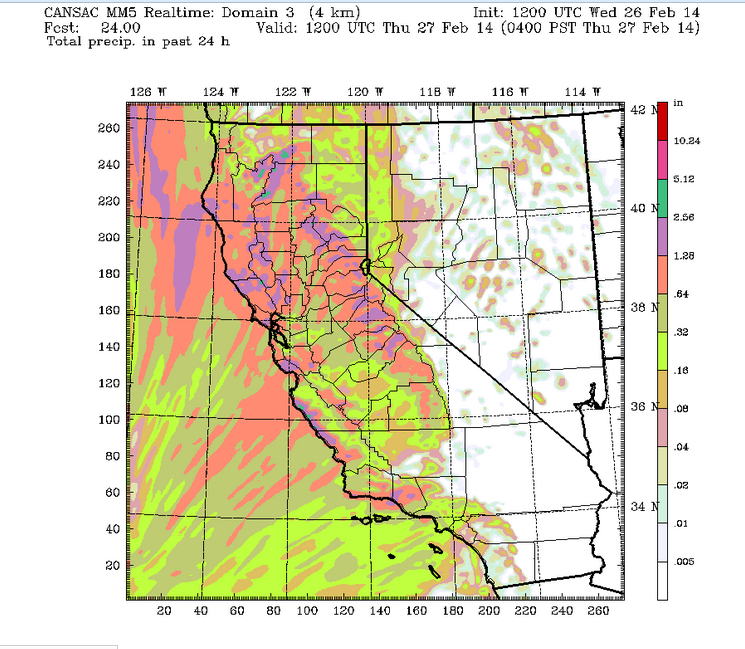 10m wind speed and wind barbs forecast by 4 km MM5 valid at 4 am PST on Feb 28, 2014. Credit: DRI-CEFA. After this time, winds will shift to SE, then rotate to S, then E, then eventually NE and Northerly as the low pressure center comes fully onshore. We expect high wind speeds at several points tomorrow, as the particular series of events mimics a rainband, then near-miss of a tropical storm. Pretty unique for the west coast! The bottom line is that it should start raining again tonight at around 4 am and we could have periods of rain through 1 pm Saturday. We may pick up 1-2 additional inches of rain here. Greetings from rain-soaked Bodega Head! 24 hr accumulated precipitation forecast by 4 km MM5 valid at 4 am UTC on Feb 26, 2014. Credit: DRI-CEFA. Sfc met variables collected at the 10m tower at BML for the 48 hours ending at 5pm PST on Feb. 26, 2014. Remeber that the time ordinate increases to the right! Credit: NOAA-HMT. 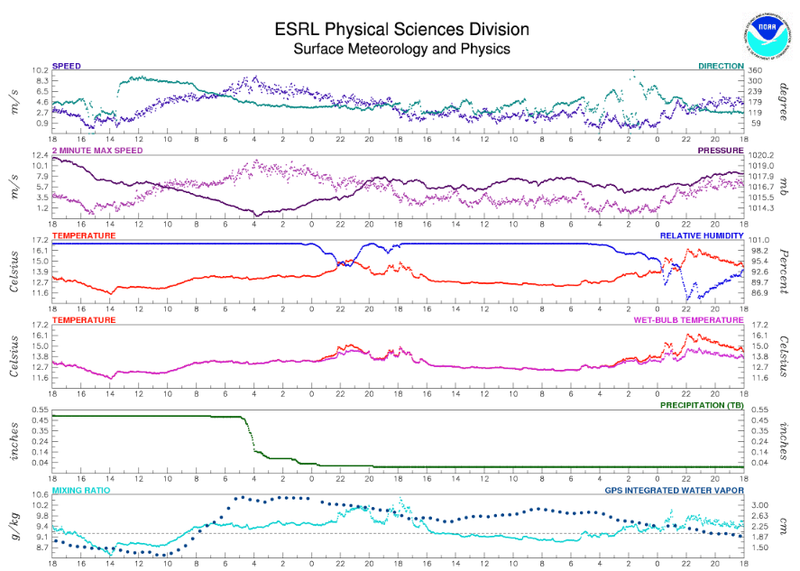 Time-vertical profile of low-layer winds, freezing level, and upslope water vapor flux. Credit: NOAA-HMT. Since the 449 MHz wind profiler is alive and kicking again, I couldnt resist posting a plot of the near-surface winds. For the most part the wind profiles themselves have been uniform and southerly in the lowest 5 km. The approaching storm is a very deep system, and since we are on the east flank, we will continue to get southerly winds until the first cold front passes us. The radar senses virtual temperature (via density) using RASS. The black dots in the later stages of the picture correspond to the freezing level above BBY, which is currently about 1.9 km high. 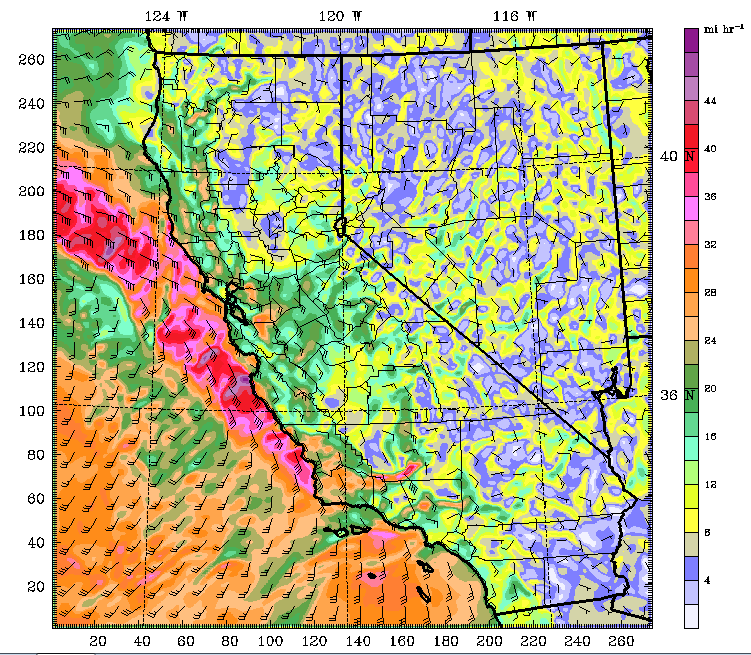 Notice that after 2 pm, the winds in the lowest 2 km have veered. As a result, the freezing level has raised slightly. Veering winds correspond to warm-air advection (WAA), so this low-level warming should be expected. We did not have a prolonged period of westerly winds as this storm approached, and therefore did not see a coastal jet. Interestingly, even though we did not, and we have not had terribly stable stratification, Cazadero has recieved less rain this event than BBY. Upslope water vapor flux corresponds to the low-layer integrated component of the wind which points from BBY to CZC multiplied by the water vapor mixing ratio. In the lower panel of the plot above, this value has been increasing along with wind speed. It is expected that as upslope wv flux increases, orographic enhancement will cause more rain to fall at CZC. Timeseries of S-Band radar signal-to-noise ratio above CZC. Credit: NOAA-HMT. The freezing level can be diagnosed from this plot by the location of the “bright band” of echos near 1.9 km. 925 hPa winds (barbs and isotachs) from 4 km MM5 valid at 0600 UTC Feb 26, 2014. Credit: DRI-CEFA. After the front, we expect a short (until 1 pm, PST Thursday) period of westerlies, during which we may have the right conditions for a jet. Winds will turn southerly again Thursday into Friday, until another front reaches us in advance of Friday’s storm system. Just for fun, I thought I would post what the high-resolution forecast of this event looks like at 72 hours simulation time. 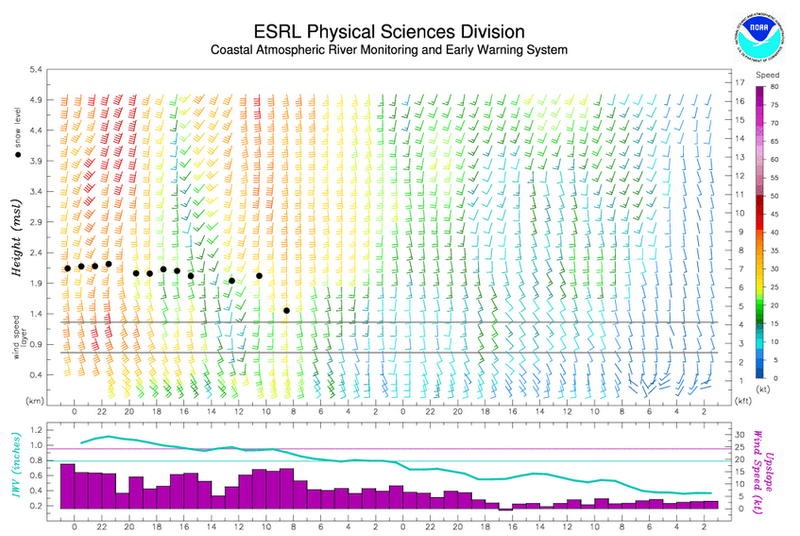 10 m wind and SLP from 4 km MM5 valid at 12 UTC on Mar 1, 2014. Credit: DRI-CEFA. Is that a west coast TC? 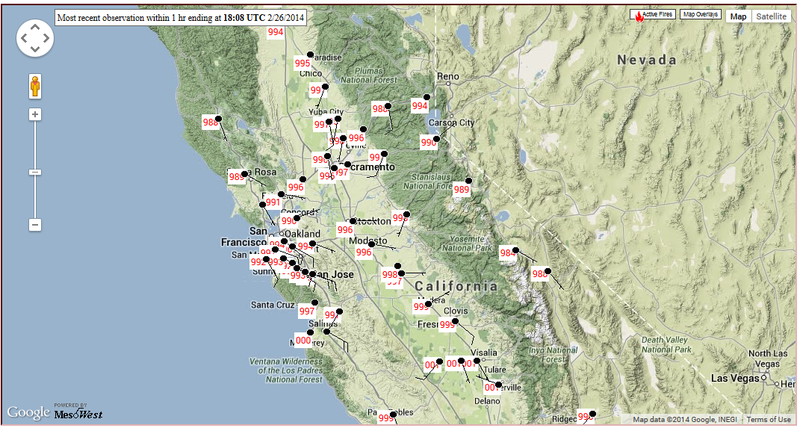 Surface station temperature and sea-level pressure from stations in N. California. Credit: Meso-West, U Utah. High pressure over the CV and East Bay, compared to relative low pressure in the North Bay and coastal Sonoma, are causing flow through the Petaluma Gap to our site in this picture. As a result, we measured very elevated particle counts, NO, NOx and Ozone for much of today. 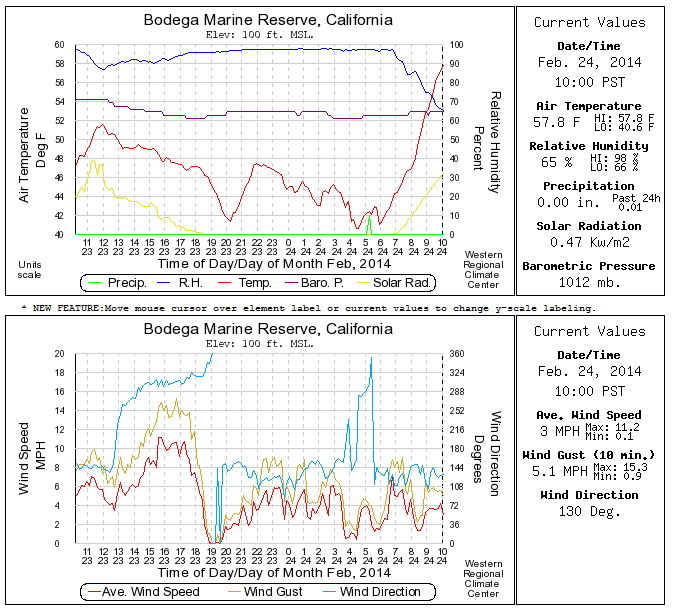 It’s a strange result, but sometimes when it is raining the air is more polluted at Bodega Bay than when it is sunny and high pressure is in control. This is especially true in light of the data we have recently worked up for periods of quiet conditions from early in the trip. We now have an idea of just how clean the air can be here when flow is onshore. A post reviewing that information will appear here tomorrow. which is going to accelerate and intensify Friday’s system, so that it will come right on the heels of today’s rain. Greetings from a rain-soaked Bodega Head! We have picked up nearly an inch of rain since 7 am PST. I missed a post last night due to an internet outage, so I’m going to leave two posts here this afternoon. 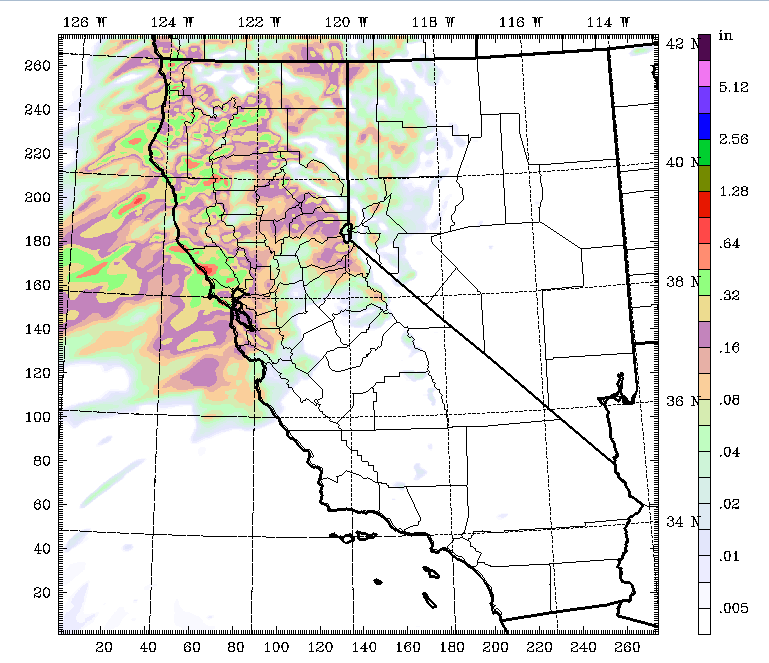 Ill get to the weather, our rain outlook for the rest of the day, Petaluma Gap flow and maybe a Coastal Jet in post two. For this post, I want to revisit the cross-Pacific transported dust we have been anticipating. 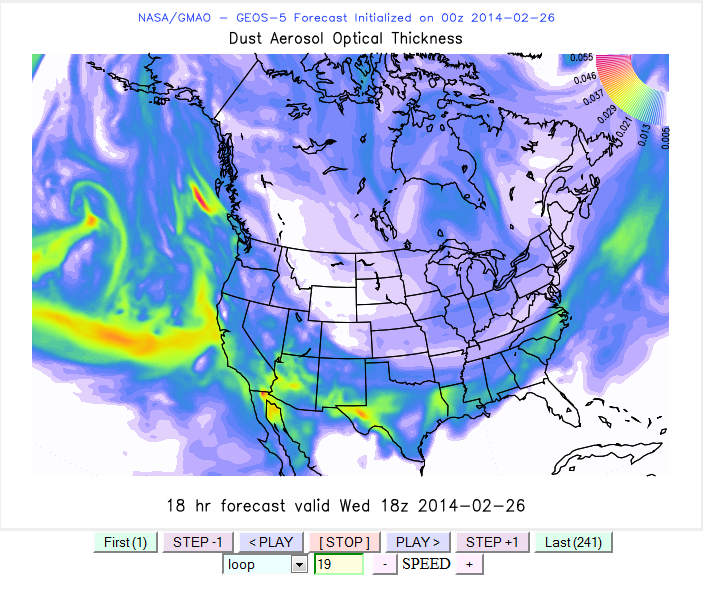 Dust AOT over North America valid at 1800UTC on Feb 26, 2014. Credit: NASA-GMAO. GEOS-5 dust global loop Credit: NASA-GMAO. You can watch the nature of this dust as it enters the eastern Pacific. Dust travels around the south flank of the storm as it heads East, and in doing so, eventually intercepts the Pacific coast. Dust traveling this pathway certainly would have had to cross the baroclinic zone associated with a trailing cold front from West to East, meaning the air parcels would have experienced forced descent along isentropic surfaces. Thus, if the forecast was reality, any dust traveling around the South flank of the storm would have descended toward the surface. Our instruments here at the surface are seeing dust, so score one for the model. We are also expecting that dust may still be present at high levels after the cold front with this storm. That feature is not well captured in the model forecast, so why are we anticipating it? Surface analysis for Gameboy Color (R) valid at 1800 UTC on Feb 24, 2014. Credit: NOAA-OPC. Cloud top temperature over the Central Pacific on Feb 24. Credit: NASA-GSFC. 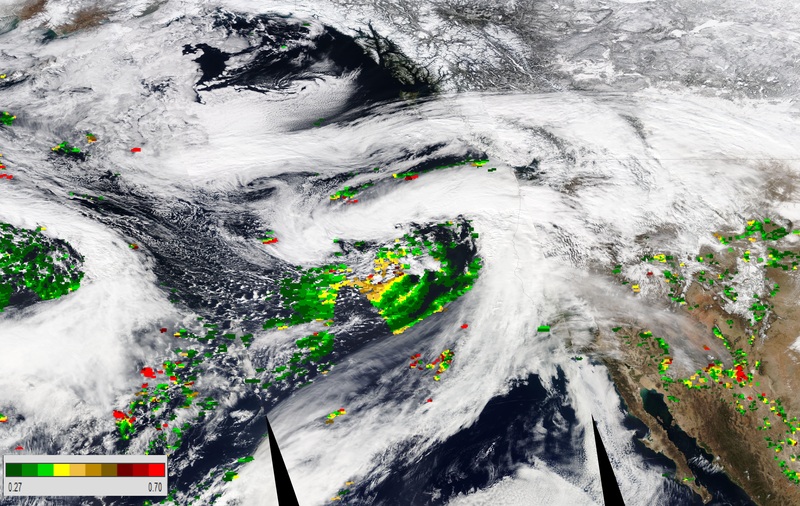 The MODIS (Terra) swath over the storm is from approximately 20 UTC. The deep purple colors indicating very cold cloud tops form a comma shape, which is classically associated with an occluded extratropical cyclone. The left inside of the comma is near the low pressure center and is an area where dry air is intruding into the storm circulation. It is relatively free of clouds. Aerosol Optical Thickness at 550 nm over the North Central Pacific on Feb 24, 2014. Credit: NASA-GSFC. The cloud free region shows elevated aerosol optical thickness, suggesting that the dust has made it into this part of the storm circulation, which is behind the cold front, along with the dry air. For us, this means we are expecting more dust to be included in the rain samples and ambient air near the time the cold front passes. Observing the shift in insoluble residue chemistry from the rain samples may tell us something interesting about the chemical history of the dust as it was processed during its journey. Greetings from Bodega Head! Today will be a short post. We are still anticipating quite a storm to arrive later in the week, and today should be our last day in the bright sunshine, northerly afternoon winds and relatively high pressure until the beginning of next week. 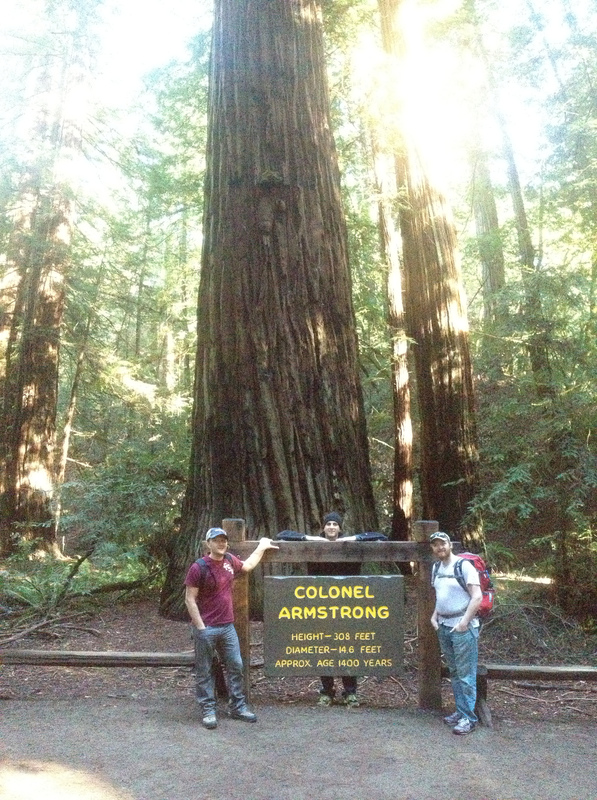 BBACPAX at the Armstrong Redwoods State Nature Reserve. Timeseries of local weather conditions at the Bodega Marine Reserve. Credit: DRI-WRCC. We have had southeasterly winds for most of the morning, leading to elevated accumulation mode particle counts at the trailer (3000 particles per cc) and few course mode particles. Unlike over the weekend, we did not see any NOx, or CO spikes from the campground to our East. We are nearing the common time for the sea-breeze to come onshore. This has happened between 10 am and 11 am PST every morning during episodes of high pressure, and we are preparing to sample elevated coarse mode (primarily sea salt) aerosols throughout this afternoon. This may be the last day we see a diurnal shift in ambient aerosol conditions for quite some time. The animation I have linked below shows the high-resolution MM5 forecast 10 m winds from this morning through late Tuesday. MM5 surface wind loop Credit: DRI-CEFA. As time passes, the elongated clockwise wind pattern offshore dissipates in favor of strengthening southerlies at the coast, followed by strong southerlies throughout the domain and eventually, it is possible that we get a coastal jet windward of the Sonoma County coastal range. There are also some slight hints that we may see Petaluma Gap Flow – something we will be watching with great interest. We are approaching the halfway point of BBACPAX, and with a prolonged period of stormy weather approaching I thought it prudent to review the primary flow regimes of the past 13 days here at the site. In this post, I presented an analysis of the typical quiescent day here at BML. The flow we were seeing at our sampling site was dominated by a diurnal cycle related to the large-scale northerlies plus the sea-breeze circulation. For the most part, we saw strong (20 kts or more) Northwesterlies in the late afternoon hours, light south-southeast winds in the early morning, and transition periods in-between. Wind Rose generated from 10-m tower anemometer at the DRI-WRCC Bodega Marine Reserve site. Credit: WRI-WRCC. This data has been compiled from the period Feb 12 – Feb 24, 2014. This period included one 24-30 hour period of large-scale southerlies associated with a landfalling pacific wintertime cyclone (PWC), but for the most part it was dominated by high pressure and quiescent conditions. The wind data in this rose comes from the Blue Oak Ranch Reserve site of the same network. The site is located windward of the Central CA coastal range but inland. Instead of two primary flow regimes here, we see simply one prevailing wind flow direction, WSW. The diurnal flow reversal we experienced during our first two weeks at Bodega Marine Lab had a profound effect on the aerosol number, size and chemistry we observed. That data is being analyzed now, and I hope to include some relevant blog posts about aerosol and trace gas concentration (with cool figures!) soon. We are still watching the storm which should arrive Wednesday. Ill post tomorrow about our chances to see unique flow features such as the Coastal Jet and Petaluma Gap Flow.